Completely undetectable, this super-fine formula instantly absorbs excess oil thanks to volcanic minerals, while perfuming your mane with the intoxicating scents of Italian lemon, rose de mai, magnolia, lily, blackberry, cedarwood, amber, patchouli, sandalwood and white musk. Like fragrance for your tresses, this is suitable for all hair colours and textures – extending the longevity of your blow dry and adding ‘grit’ without a chalky finish. 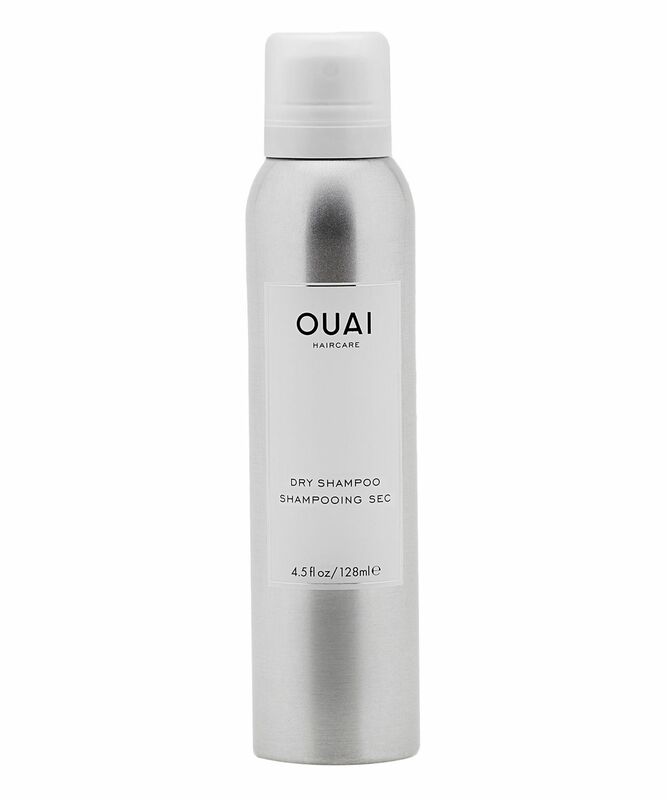 From celebrity coiffeuse Jen Atkin – responsible for maintaining the manes of Klan Kardashian, Gigi Hadid and Gwen Stefani (to name a few) – OUAI’s Dry Shampoo is enriched with the brand’s signature ‘Smart Technology’; a cocktail of nourishing ingredients including amino acids, tamarind seed, keratin, ama oil, hibiscus and jasmine to strengthen, enhance moisture levels, repair and protect from humidity. Phenomenally oil-absorbent but non-powdery, this is so featherweight that it’s completely invisible – refreshing hair in-between washes and adding root ‘oomph’ to hair that’s falling flat. It’s a definite must-have addition to your hair care arsenal (and it looks très chic in your bathroom cabinet/desk drawer/handbag…). Jen's Tip: Apply to dry hair to revitalise yesterday’s style for perfectly lived in hair. Hydrofluorocarbon 152A, Dimethyl Ether, Alcohol Denat., Zeolite, VP/VA Copolymer, Panthenol, Tocopheryl Acetate, Actinidia Chinensis (Kiwi) Fruit Extract, Aloe Barbadensis (Aloe Vera) Leaf Extract, Hedychium Coronarium (Ginger) Root Extract, Mangifera Indica (Mango) Fruit Extract, Passiflora Incarnata (Passion Flower) Extract, Helianthus Annuus (Sunflower) Seed Extract, Glycerin, Butylene Glycol, Aqua (Water, Eau), Parfum (Fragrance), Acetyl Triethyl Citrate, PEG/PPG-17/18 Dimethicone, Benzoic Acid, Sorbic Acid, Phenoxyethanol, Chlorphenesin, Alpha-Isomethyl Ionone, Limonene, Geraniol, Hydroxycitronellal, Linalool, Citronellol. I don’t know where to start with this product. I got this in the travel size as I had never used a Ouai product before but I had high hopes as it seems to be popular and I thought it would be good quality. I sprayed it about 3 times onto my roots from a distance and that was enough for me to hate it. The smell is so so strong and artificial. If I wanted to smell like perfume then I would put some perfume on, not spray it on my hair and something about a strong, pungent fragrance on my roots does not sit well with me and cannot be good for your hair. Secondly, I don’t get why anyone would want “texture” or “grit” from a dry shampoo. When I shampoo my hair it feels clean and brand new, which is what I thought this would give me but instead it made my hair cling to my scalp and it was greasier than before I used it. Thirdly, the price is ridiculous considering how bad it is. Definitely won’t be buying from this brand again. Total flop sorry! The first try was good - the product smells really nice and leaves the hair fresh. But the second time and third tries were a total fail, product was liquid and not dry anymore and it messed up my hair. So for the price tag - I really don't recommend this product..